Most companies will see a discrepancy between the transaction volumes recorded via web analytics and those recorded via internal sales or financial database. This article focuses on how to find and reduce that discrepancy, to give greater credibility to your web analytics data. Following on from our article on common Google Analytics setup problems, we are often asked why Google Analytics ecommerce tracking is not a 100% match with other records, and what is an acceptable level of difference. Inspired by a talk from Richard Pickett at Ensighten, here is a checklist to run through to reduce the sources of mismatch. 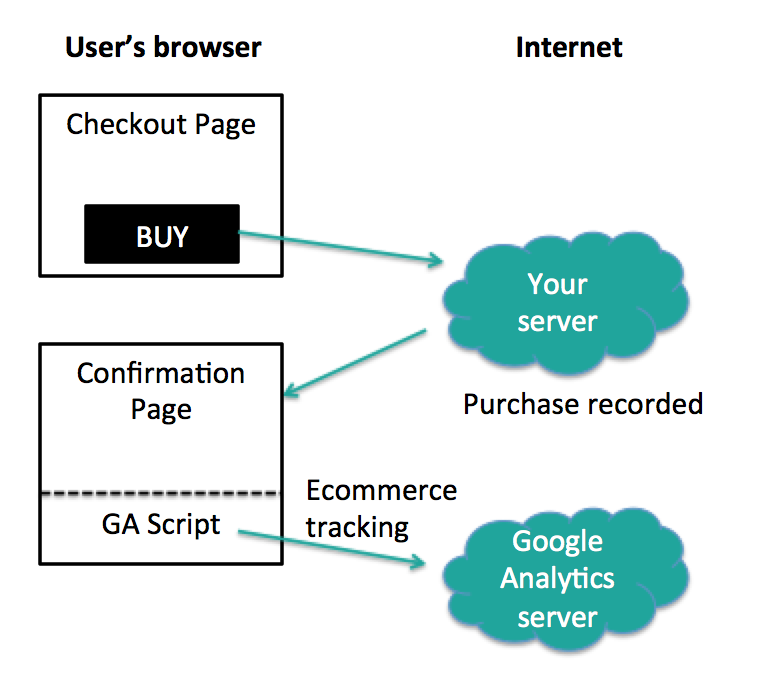 The focus here is Google Analytics Ecommerce tracking, but it could apply to other systems. In summary, you wouldn’t ever expect there to be a 1:1 match, due to the different paths the two events take over the internet. The general consensus is that anything less than 4% of difference in transaction volumes is good, but could sometimes persist up to 10%. Factors that affect this target rate include how many users have got ad blockers or disable Google Analytics (popular in Germany, for example), what proportion are on mobile devices (which suffer from more network interruptions) and how the purchase thank you / confirmation page is built. That way your users do the testing for you, and you can drill into exactly which browsers and versions the bugs are affecting. 2. Is the tracking code as far up the page as it could be? If the user drops their internet connection before the whole page loads then the ecommerce event data won’t get a chance to fire. The best approach is to load the script at the bottom of the <head> element or top of the <body>. The Google Analytics script itself won’t block the page load, and arguably in this one purchase confirmation page, the tracking is more important than the user experience. 3. Is the tracking code firing before all the page data has loaded? The inverse of the previous problem: you may need to delay firing the tracking code until the data is ready. This is particularly an issue if your ecommerce transaction data is ‘scraped’ from the HTML elements via Google Tag Manager. If the page elements in question have not loaded before the ecommerce tracking script runs, then the product names, SKUs and prices will be empty – or returning an error. 4. Is the problem only your ecommerce tracking script or just page tracking is general? It could be that the way you are sending the transaction data (e.g. product name, price, quantity) is the problem, or that the page tracking overall is failing in some cases. You can pinpoint where the problem lies by comparing the pageviews of the confirmation page, with the number of ecommerce events tracked. Caveat: on many sites, there’s another route to seeing the purchase confirmation page, which doesn’t involve purchasing (for example as a receipt of a historic purchase). In that case, you may need to capture a unique purchase event, which only fires when a new purchase is confirmed – but without any information on the transaction or products. 5. Are events from your test site excluded? Most companies will have a development, staging or user acceptance testing server to where the website is tested, and test users can purchase. Are you blocking the tracking from these test sites? 6. Is your tag set with a high priority? If you use Google Tag Manager and have multiple tags firing on the tracking page it’s possible that other tags are blocking your ecommerce data tag from firing. Under ‘Advanced settings’ in the tag editor, you can set a higher priority number for tag firing; I assume the ecommerce data to Google Analytics is always the first priority. 7. Are any strings in the product name properly escaped? The solution is to run a script across any text field to either strip out the quotation marks or replace any quotes with their HTML equivalent (eg &quot;). 8. Are your quantities all integers? One of our clients was selling time slots, and so had the ‘quantity’ of the ecommerce tracking data equivalent to a number of hours. Timeslots sold in half-hours (e.g. 1.5 hours) were not tracking… because Google Analytics only recognises a quantity which is a whole number, so sending ‘1.05’ will not be recognised as 1. 9. Are any possible ‘undefined’ values handled? It may be that the data on your products is incomplete, and some products that people buy do not have a name, price or SKU. These will then clearly show up in your Ecommerce Product performance reports and the data can be cleaned up. 10. Are users reloading the page and firing duplicate tracking events? Check whether this is a problem for your site by using our duplicate transactions custom report to see multiple events with the same transaction ID. A solution is to set a ‘has tracked’ cookie after the ecommerce tracking has been sent the first time, and then check whether the cookie is set before sending again. 11. Are users going back to the page and firing the tracking at a later date? The sessions column in the transactionID report in step 9 should give you an idea of whether the problem is repeat page loads in one session, or users revisiting the page in another session. Could users be seeing the page again by clicking on a link to an email, or from a list of historic orders? Are there any back-end admin pages that might link to the confirmation page as a receipt? In both cases, the solution is to have a different URL for the receipt that the one where the ecommerce tracking is fired. If there are any other troubleshooting steps you have found helpful, please let us know in the comments or get in touch!